According to sources cited in Oil World (2005), the market trend for vegetable oils is increasing, and palm, soy and rapeseed oils have the highest growth. The three oils differ in fatty acid composition and thus the different vegetable oils are in general not completely substitutable. But while the demands of some applications can only be met by a few of the oils, the demands of the major applications of vegetable oils can be met by several oils. This example deals with the bulk of oils that covers the major applications. In this example we know that the vegetable oil market has an increasing market trend, which means that we will find the marginal technology by looking for the most competitive technology. Furthermore we have to make sure the marginal technology for vegetable oil is within the relevant market segment and among those producers that are flexible, i.e. not constrained by legal, physical or market conditions. The figure above is presented in Schmidt and Weidema (2008) based on Oil world 2005 data. 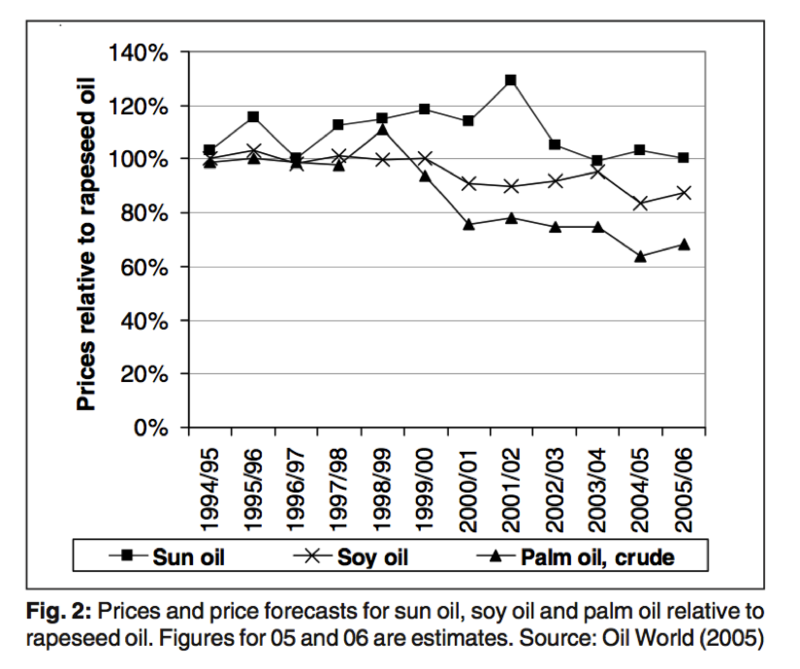 From this figure we see that since 1999/00, the most competitive oil has been crude palm oil followed by soy oil. Sunflower oil is the least competitive. Before 1999/00, only little difference between rapeseed oil, soy oil and palm oil can be seen. From 1994 to 2000, rapeseed oil was the most competitive oil, but after that, the price has increased due to increased demand for this oil as biodiesel oil (Dahl (2005) as cited in Schmidt and Weidema 2008). We can therefore conclude that, at this point in time, palm oil is the marginal vegetable oil. More details and discussion can be found in Schmidt and Weidema (2008). As mentioned in the information sources we have used here (which are from 2005 and 2008 respectively), the marginal supply of vegetable oils is not necessary constant over time. Changes in technologies, in the market situation, in the regulation or in constraints on the production, may cause changes in the marginal supply. Therefore one has to seek up-to-date knowledge about the current situation.